The Amazon Basin, with an area of ∼6.0 M km2 and containing the largest tropical rainforest in the world, contributes 15% to 20% of the global river discharge to the oceans (annually averaged discharge of ∼200,000 m3/s). Fodplains of the Amazon and its tributaries are built from overbank deposits with an overall annually inundated area of about 750,000 km2. The mainstem floodplain is built from the fluvial delivery of sediments and reworking over a few thousand years by the migration of both the Amazon River and floodplain channels. (a) The white and black bars show histograms of the prior and posterior bathymetric slope ensembles, respectively; the true slope (square) and the prior (circle) and posterior (triangle) ensemble mean are also indicated. For 18 September 1995, (b) true WSE, (c) prior and (d) posterior ensemble mean WSE, and (e) prior and (f) posterior ensemble standard deviation are shown (see details in Durand et al, ). Estimated elevation (green line) and slope (red line) of the Amazon River. 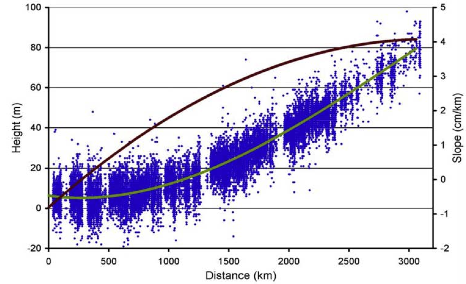 A third-order polynomial (green line) fitted to water surface SRTM elevations (blue dots) from the main Amazon channel provides a derivative for estimating slope variations along the entire profile (see details in LeFavour and Alsdorf ). (top) Changes in water levels (dh/dt) and (bottom) perspective views of central Amazon floodplain topography. View is looking east, and panels are 75 km across the foreground. Colors indicate water level rise from (top left) 26 February to 11 April 1993 and (top right) 15 April to 12 July 1996. The top panels are entirely water surfaces (no land surfaces are plotted) and are measured from interferometric JERS-1 SAR phase. Sharp variations in dh/dt occur across floodplain channels (arrows, top). These unexpected variations are indicative of flows and their transported sediments and carbon (see details in Alsdorf et al. ). The Congo River is Africa's most powerful river and the second most voluminous river in the world both in terms of a discharge of nearly 40,600 m3/sec and a basin of nearly 3,500,000 km3. Congo wetlands are known as swamp forests located mostly in broad topographic depressions of the central basin interfluvial regions. The Congo Basin is uniquely located with respect to the Inter-Tropical Convergence Zone (ITCZ) such that precipitation peaks occur twice annually. Water level changes (dh/dt) measured via interferometric synthetic aperture radar from the Japanese Earth Resources Satellite (JERS-1). 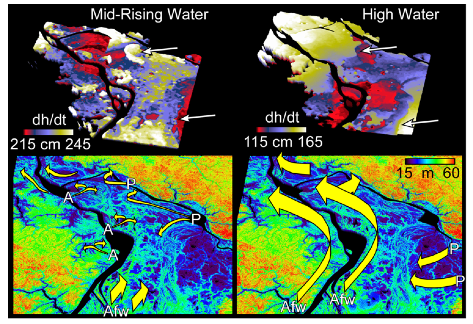 The spatial patterns of the images have led to new insights concerning the Amazon (A) and Congo (B) floodplains. The Amazon floodplain is highly interconnected by channels, resulting in complex flow patterns. In contrast, flow patterns in the Congo are less governed by channel connectivity and flooded areas lack well-defined boundaries (see details in Jung et al. ). The climate of Ohio is continental with a seasonal temperature range between a normal daily minimum of 6.5°C in January to a normal daily maximum of 29.6°C in July. Precipitation is highest in the Spring and Summer and ranges from a low monthly average in February of 5.6 cm to a high of 11.7 cm in July (snowfall reaches a monthly maximum of 22.4 cm in January). January and February 2000 mean temperatures were 2.4°C and 3.3°C, respectively. Ohio reservoirs. O’Shaughnessy Reservoir is shown in the X-band (left side) and C-band (right side) DEMs where elevations of 200 to 300 m are scaled from deep red to bright yellow, respectively. Center panels are true color Landsat imagery from 17 February 2000 (see details in Kiel et al. ). please contact the webmaster at . Page last updated: Tue May 27 2014 15:40:06 EDT. ©1998-2019 Byrd Polar Research Center.